It may be possible to avert threatened species declines by protecting refuges that promote species persistence during times of stress. To do this, we need to know where refuges are located, and when and which management actions are required to preserve, enhance or replicate them. Here we use a niche-based perspective to characterise refuges that are either fixed or shifting in location over ecological time scales (hours to centuries). We synthesise current knowledge of the role of fixed and shifting refuges, using threatened species examples where possible, and examine their relationships with stressors including drought, fire, introduced species, disease, and their interactions. Refuges often provide greater cover, water, food availability or protection from predators than other areas within the same landscapes. In many cases, landscape features provide refuge, but refuges can also arise through dynamic and shifting species interactions (e.g., mesopredator suppression). Elucidating the mechanisms by which species benefit from refuges can help guide the creation of new or artificial refuges. Importantly, we also need to recognise when refuges alone are insufficient to halt the decline of species, and where more intensive conservation intervention may be required. We argue that understanding the role of ecological refuges is an important part of strategies to stem further global biodiversity loss. 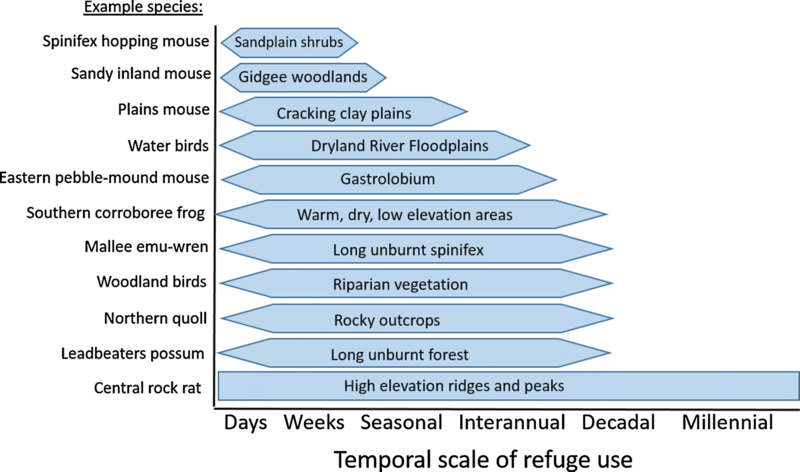 Examples of refuge types and the species that use them. Refuges can sit along a temporal continuum between shifting and fixed refuges. See text for further detailed discussion on each species. Reference: Reside, A. E., Briscoe, N. J. , Dickman C. R., Greenville, A. C., Hradsky, B. A., Kark, S., Kearney, M. R., Kutt, A. S. , Nimmo, D. G., Pavey, C. R., Read J. L. , Ritchie, E. G. Roshier, D., Skroblin, A., Stone, Z., West, M., & Fisher, D.O. (2019). Persistence through tough times: fixed and shifting refuges in threatened species conservation. Biodiversity and Conservation, In Press. The dingo is one of Australia’s top-predators. Photo by Bobby Tamayo. Smith B.P, Cairns K.M, Crowther M.S, Adams J.W, Newsome T.M, Fillios M, Deaux E.C., Parr W.C.H, Letnic M., van Eeden L.M., Appleby R.G., Bradshaw C.J.A, Savolainen P., Ritchie E.G., Nimmo D.G., Archer-Lean C., Greenville A.C., Dickman C.R., Watson L., Moseby K.E., Doherty T.S., Wallach A.D. & Morrant D.S. (2019). Taxonomic status and nomenclature of Australia’s native canid: the case to retain Canis dingo (Meyer 1793). Zootaxa, 4564: 173-197. Jackson S. M., Fleming P. J. S., Eldridge M. D. B., Ingleby S., Flannery T. I. M., Johnson R. N., Cooper S. J. B. & Mitchell K. J. 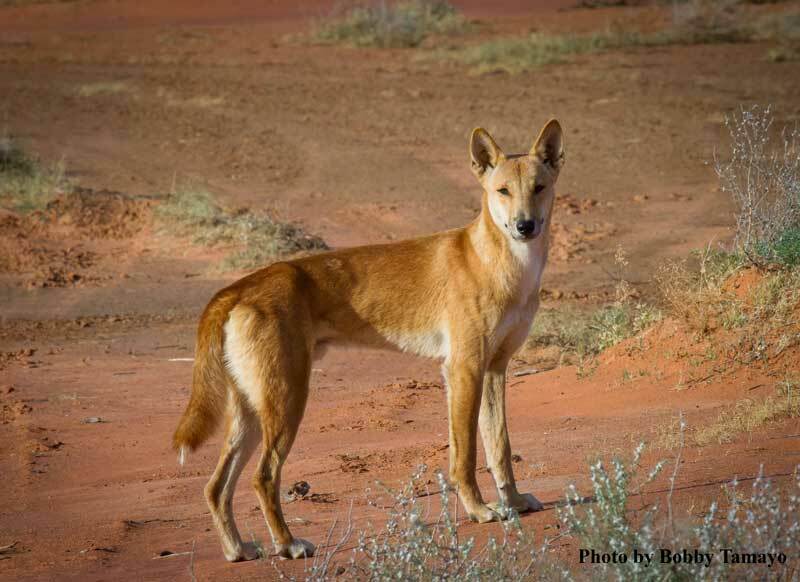 (2019) The Dogma of Dingoes—Taxonomic status of the dingo: A reply to Smith et al. Zootaxa 4564. The dingo is a true-blue, native Australian species. The Conversation, March 2019. Australian dingo is a unique Australian species in its own right. Science Daily, March 2019. Australian researchers say dingo is not a dog, but own species. Rappler Philippines, March 2019. Australian researchers say dingo is not a dog, but own species. New Straits Times Malaysia, March 2019. Researchers want dingoes ‘protected’. Katherine Times, March 2019. Australian researchers say dingo is not a dog, but its own species. GMA NEWS, March 2019. Dingoes are a ‘fair dinkum’ separate species needing better protection, researchers say. ABC NEWS, March 2019. Give the dingo its due, the ‘Aussie wolf’ is not a dog: Scientists. Brisbane Times, March 2019. Dingoes aren’t dogs but native Aussies. Keep it Clever, March 2019. Authors: Dale G. Nimmo, Sarah Avitabile, Sam C. Banks, Rebecca Bliege Bird, Kate Callister, Michael F. Clarke, Chris R. Dickman, Tim S. Doherty, Don A. Driscoll, Aaron C. Greenville, Angie Haslem, Luke T. Kelly, Sally A. Kenny, Jos´e J. Lahoz-Monfor, Connie Lee, Steven Leonard, Harry Moore, Thomas M. Newsome, Catherine L. Parr, Euan G. Ritchie, Kathryn Schneider, James M. Turner, Simon Watson, Martin Westbrooke, Mike Wouters, Matthew White and Andrew F. Bennett. Nimmo D. G., Avitabile S., Banks S. C., Bliege Bird R., Callister K., Clarke M. F., Dickman C. R., Doherty T. S., Driscoll D. A., Greenville A. C., Haslem A., Kelly L. T., Kenny S. A., Lahoz-Monfort J. J., Lee C., Leonard S., Moore H., Newsome T. M., Parr C. L., Ritchie E. G., Schneider K., Turner J. M., Watson S., Westbrooke M., Wouters M., White M. & Bennett A. F. (2018). Animal movements in fire-prone landscapes. Biological Reviews, In press. New insights on animal movement in fire-prone landscapes, EurekAlert!, December 2018. Published in: Journal of Zoology. Populations of the Kowari in South Australia are in decline and may need to be listed as Endangered. Photo Billy La Marca. when resources increase. Understanding drought-wet cycle dynamics is important for managing arid ecosystems, particularly if populations of threatened species are present. Such species may face increased risks of extinction if all populations decrease synchronously toward zero during low-resource periods, and if key refuge habitats needed during these periods are disturbed or unavailable. Here, we describe the dynamics and habitat requirements of two sub-populations of the kowari, Dasyuroides byrnei (Marsupialia: Dasyuridae), during long-term sampling (2000–2015) that encompassed multiple drought-wet cycles. This species is listed currently as Vulnerable on the IUCN Red List. We found that the study region contains favourable habitat, with kowari occurring on hard stony (gibber) pavements in association with coverage of sand that may facilitate construction of burrows. Both sub-populations of kowari declined over the study period irrespective of climatic conditions, despite some evidence that both body condition and reproductive output increased after rain. We suggest that the studied sub-populations are under stress from extrinsic rather than intrinsic factors, with livestock grazing and introduced predators perhaps having the most negative effects. If similar demographic trends are apparent elsewhere in the species’ small geographical range, the species would be eligible for listing on the IUCN Red List as Endangered, with a 20% chance of extinction within the next 20 years. Urgent research is required to quantify and mitigate the extrinsic threats to kowari populations. Proactive measures such as captive breeding to act as insurance populations would be prudent. Reference: Greenville, A.C., Brandle, R., Canty, P. and Dickman, C.R. (2018). Dynamics, habitat use and extinction risk of a carnivorous desert marsupial. Journal of Zoology, 306, 258–67. New paper! Understanding selective predation: are energy and nutrients important? Authors: Tamara I. Potter, Hayley J. Stannard, Aaron C. Greenville and Chris R. Dickman. For generalist predators, a mixed diet can be advantageous as it allows individuals to exploit a potentially broad range of profitable food types. Despite this, some generalist predators show preferences for certain types of food and may forage selectively in places or at times when these foods are available. One such species is the lesser hairy-footed dunnart (Sminthopsis youngsoni). Usually considered to be a generalist insectivore, in the Simpson Desert, Australia, this small marsupial predator has been found to selectively consume wolf spiders (Family Lycosidae), for reasons yet unknown. Here, we tested whether lycosids have relatively high energy or nutrient contents compared to other invertebrates, and hence whether these aspects of food quality can explain selective predation of lycosids by S. youngsoni. Energy, lipid and protein composition of representatives of 9 arthropod families that are eaten by S. youngsoni in the Simpson Desert were ascertained using microbomb calorimetry, chloroform-methanol extraction and Dumas combustion, respectively. Although lycosids contained a high proportion of energy and nutrients, they were not found to yield statistically greater amounts of these food components than many other available arthropod prey that are not selected by S. youngsoni. Our results therefore suggest that alternative factors may be more influential in shaping dietary selection in this marsupial predator, such as high rates of encounter between lycosids and S. youngsoni. Reference: Potter, T., Stannard, H. J., Greenville, A.C. & Dickman, C.R. (2018). Understanding selective predation: are energy and nutrients important? Plos One, 13: e0201300 . Field work doesn’t always go to plan and can lead to gaps in your datasets. Long-term field-based monitoring is essential to develop a deep understanding of how ecosystems function and to identify species at risk of decline. However, conducting field-based research poses some unique challenges due to the frequently harsh environmental conditions or extreme weather events that may be encountered. Fieldwork issues can arise from vehicle breakdowns, wildfires and heavy rainfall events, all of which can delay or even cancel data collection. In addition, long-term monitoring often requires multiple observers, which may add observation bias to estimates of measured parameters. Thus there is an increasing need to develop new statistical techniques that take advantage of the power of long time-series datasets that also are incomplete. Here we introduce researchers to multivariate autoregressive state-space (MARSS) modelling; a new statistical technique for modelling long-term time-series data. MARSS models allow users to investigate incomplete datasets caused by missing values. In contrast to traditional modelling techniques, such as generalised linear models that only estimate error from environmental stochasticity (process error), MARSS models estimate both process and observation errors. By estimating observation errors, researchers can incorporate bias from different observers and methods into population or other parameter estimates. To illustrate the MARSS technique we interrogate long-term animal and plant datasets from central Australia that contain missing values and were collected by multiple observers. We then discuss the findings from the MARSS models and their implications for management. Lastly, we provide future applications that this new technique could be used for, such as studies of animal movements and food webs. #FieldWorkFail? Making the most of incomplete long-term datasets, TERN Newsletter, September 2018. Reference: Greenville, A. C, Nguyen, V., Wardle, G. M. & Dickman, C. R. (2018). Making the most of incomplete long-term datasets: the MARSS solution. Australian Zoologist, In-Press. Authors: Tamara I. Potter, Aaron C. Greenville & Chris R. Dickman. Great work by Tamara and her first paper from her Honours work! form of interference competition, where a dominant predator selectively kills subordinate rivals to gain increased access to resources. However, before IGP can be identified, organisms must be confirmed as members of the same guild and occur together in space and time. (Sminthopsis youngsoni, Dasyuridae) is a generalist marsupial insectivore in arid Australia, but consumes wolf spiders (Lycosa spp., Lycosidae) disproportionately often relative to their availability. Here, we test the hypothesis that this disproportionate predation is a product of frequent encounter rates between the interactants due to high overlap in their diets and use of space and time. Diet and prey availability were determined using direct observations and invertebrate pitfall trapping, microhabitat use by tracking individuals of both species-groups, and temporal activity using spotlighting and camera traps. Major overlap (greater than 75% similarity) was found in diet and temporal activity, and weaker overlap in microhabitat use. Taken together, these findings suggest reasonable potential, for the first time, for competition and intraguild predation to occur between taxa as disparate as marsupials and spiders. Potter, T., Greenville, A.C. & Dickman, C.R. (2018). Assessing the potential for intraguild predation among taxonomically disparate micro-carnivores: marsupials and arthropods. Royal Society Open Science, 5: 171872. Marsupial species eats spiders to stop spiders eating insects, Australia’s Science Channel, May 2018. The marsupial mouse eats its competitors (Dutch), Scientias, May 2018. This dunnart has competition for food… so it just eats the competition, Australian Geographic, May 2018.